10 months, 300 pages and 12,000 products later, the world’s favourite furnishing giant gets that one mega marketing tool that it fearlessly spends 70% of its’ annual marketing budget on. In 2013, the number of IKEA catalogues printed(208 million copies) outnumbered that of the Holy Bible. IKEA visits around 1,000 customers at home every year to find out how people really live at home – how much space do they have, what styles do they prefer? In order to show solutions in a way people can relate to, the catalogue is divided by activities you can do with the IKEA range – tips and ideas on how to solve specific needs and dreams. It’s about the way people live and how IKEA products can improve their lives. The catalogue evolves each year with images getting more spectacular, technology being integrated and ideas going beyond regular furnishing solutions. For 2014 it launches the theme of living with children, based on the knowledge that all moments count for families with children. It offers safe, affordable, sustainable solutions – helping families make the most of time spent together. And it continues to innovate, with around 50 pages that can be scanned to access extra content. But the big news for this year is the augmented reality, which enables readers to see how around 100 products will look in their home – in 3D! Almost 211 million catalogues have been printed in 66 editions and 30 languages. You can view the online version of the catalogue here. When a company invests so consistently in a property, it’s advertising intensity isn’t compromised on either. 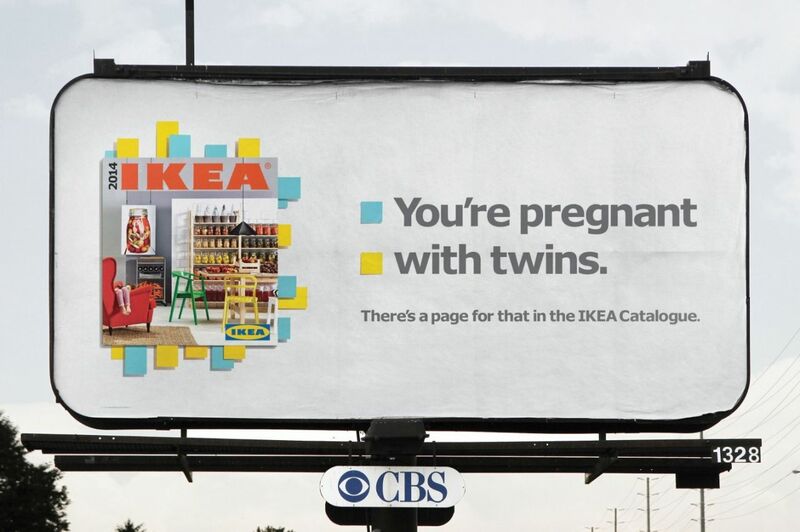 Below is a series of outdoor hoardings that IKEA put up across various cities. Each of these hoardings have carefully been crafted to reach the very wide range of target audience that the company has. 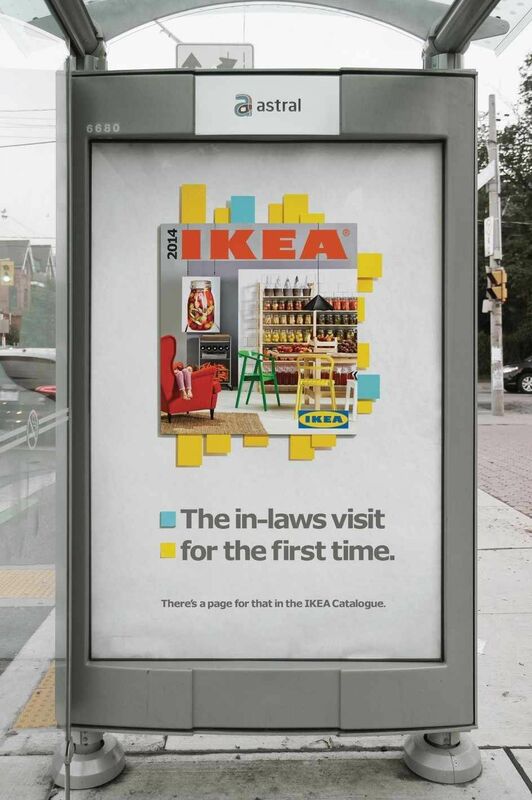 The hoardings with the tagline, ‘There’s a page for that in the IKEA Catalogue’ focuses on different life situations that cover almost every age group, focusing on the fact that IKEA has an answer to everything. The hoardings also show two coloured bookmarks that are simultaneously associated with one of the two statements. The first statement, a regular scenario, is bookmarked in Blue and the second one, the surprise, is bookmarked in yellow, suggesting that the Catalogue can handle any situation. The design is copy focused, clean and eye-catching. Perfect for the everyday passer-by. The hoardings highlight the wholesomeness of the catalogue, along with the numerous products that it contains. 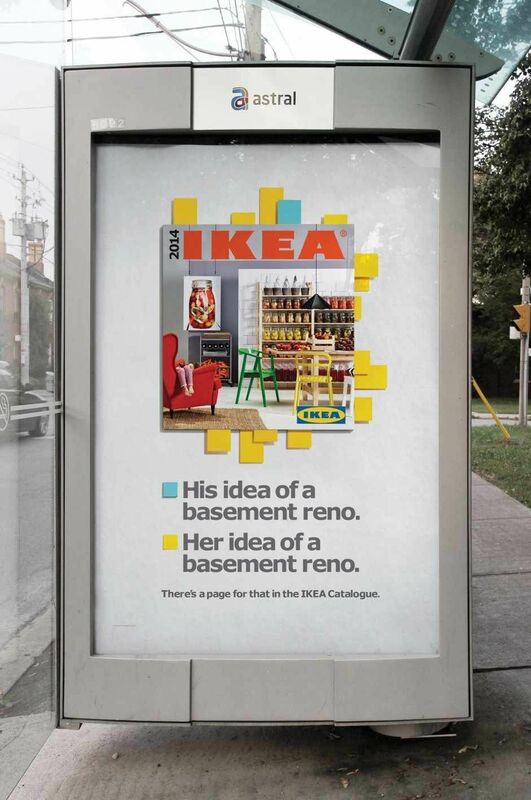 It’s also a two-birds-with-one-stone kind of strategy where the series gives a message that an IKEA Catalogue is ALWAYS relevant. That’s that from IKEA. Do drop your comments below. Or go ahead, and read more posts. There’s no such thing as too many awesome ads watched in one day. No such thing. #Day25 – Adopt a Pet To Complete Your Home. In a new awareness campaign ‘Home for Hope’, local animal advocates – Animal Lovers League shelter and the Save Our Street Dogs shelter – are playing up the idea that no home is complete without a pet. They are trying to reach potential new adopters through partnerships with Ikea and a growing number of furniture stores. 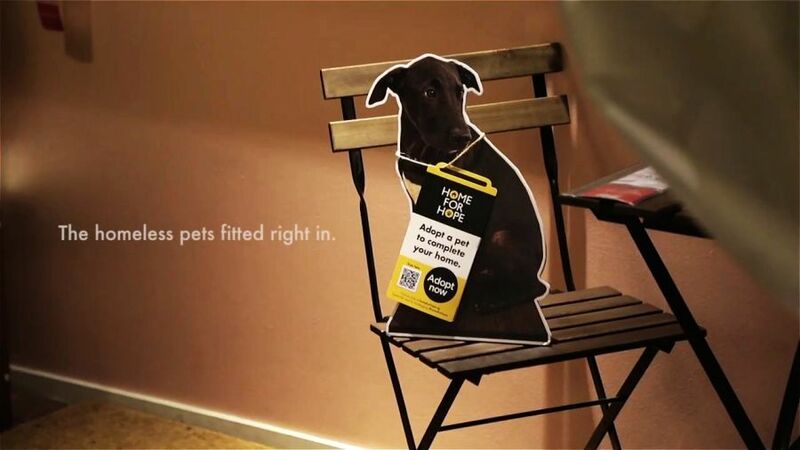 For the campaign, they took photos of adoptable dogs in order to make life-size cardboard cut-outs and place them throughout Ikea showrooms. 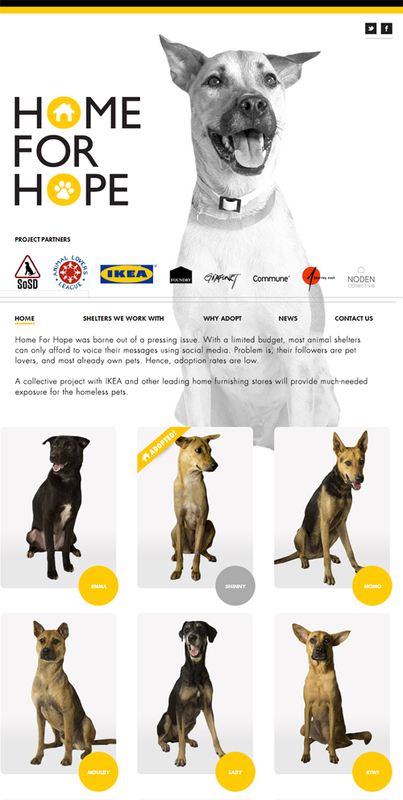 The idea was to let shoppers, visiting select Ikea stores in Singapore, envision what a new canine companion would look like, hanging out in their homes. In turn, they hoped to instil the idea in them and inspire them to adopt a pet. Shoppers could scan the QR code and get information on the scanned pet along with the other pets that were up for adoption, on their website. With a limited budget, most animal shelters can only afford to voice their messages using social media. But the usual problem is that their followers are pet lovers, and most already own pets. Hence, adoption rates are low. By tying up with prominent furniture stores, the problem of awareness amongst potential adopters, increases. Why I absolutely love this idea is because, very rarely, you see campaigns that are so perfectly positioned to reach your target audience. The fact that you get a sneak peek into how your house would look like with a pet, is an image that will imprint in your brain and become a trigger quite instantly. And hey, those dogs are so adorable!